Spam is on the rise, officials with the Internet’s search and ad leader told TMCnet during an interview today, and the cyber-criminals behind it are developing more sophisticated attacks, partly in response to the shut-down of a California-based Web hosting service provider that carried massive amounts of malware and botnet traffic. 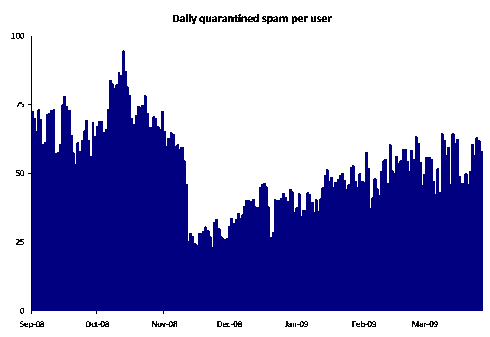 According to Adam Swidler, a product marketing manager at Google Inc., spammers have become more media-savvy and are using “newsy” hooks – such as an economic recession that’s fueled record unemployment levels – to get computer users to click on infected items, add a machine to a botnet and introduce malware. Swidler’s comments come as his colleague at Google – Amanda Kleha of the Mountain View, California-based company’s security and archiving team – posts here about rising spam trends. Specifically, the Postini, Inc. (a Google subsidiary) team says, spammers have rallied since the late-2008 takedown of McColo – the San Jose, California-based company which two upstream providers shut down because of the malicious traffic coming from McColo servers. It’s a timely topic. As TMCnet reported today, many security experts are trying to quell fears that the so-called “Conficker” worm is poised for a massive April Fools’ Day attack tomorrow. Conficker surfaced in October and it targets the Microsoft Windows operating system – not Macs. The worm, which exploits vulnerabilities in the Windows Server, has been difficult for network operators and law enforcement to counter because it uses several advanced malware techniques. Swidler told TMCnet that although there’s something in the worm (its most recent variant is called “W32.Downadup.C”) that refers to April 1, there’s no hard data to predict what will happen tomorrow, one way or another. Even so, the cyber-crime market is fertile. Just this week, federal officials warned in a new report that Web fraud reported to U.S. authorities increased by 33 percent last year. According to the so-called “Internet Crime Complaint Center,” or “IC3” – a joint agency of the Federal Bureau of Investigation and the National White Collar Crime Center – that trend marks the first rise in three years, and is surging this year as the recession deepens. Specifically, of 275,284 complaints received in 2008 by IC3, about 72,940 were referred to U.S. law enforcement agencies for prosecution. “It is our belief that these numbers, both the complaints filed and the dollars, represent just a small tip of the iceberg,” Kane, managing director of the National White Collar Crime Center in Richmond, Virginia. According to Kleha, the most significant development for spammers appears to the emergence of “location-based” attacks, which find out where an individual users is based – using source IP information – and then directs that user to a fake news headline that may describe a crisis or disaster in a nearby city. Officials at Google’s Postini-powered security and archiving services have vast experience in the field, as they view and eradicate spam from more than 3 billion enterprise e-mail connections every day, including 50,000 businesses and 15 million business users. Swidler told TMCnet that, primarily, what drives spammers are numbers. The cyber-criminals seek to cast their nets as wide as they can, Swidler said. The big message for computer users is to be vigilant in terms of both actions and defenses, according to Swidler. Business, especially, should look for cloud-based solutions – Google’s is among the best – to keep spammers at bay. “Businesses, particularly those running their own e-mail servers, should make sure their systems are updated,” he said.